Francisco de Sa Carneiro was the Prime Minister of Portugal, but his tenure in office lasted less than a year as he was killed in a plane crash. Sa Carneiro’s chart has two distinctly different configurations of planets. The Sun is in very close conjunction to Pluto at the base of the chart. The Moon is also in very close conjunction with Jupiter. The Moon / Jupiter is the focal T square point of an opposition between Mercury at the nadir of the chart and the Midheaven which indicates great success involving his career and his homeland. This is the aspect that elevated him to the highest office in Portugal. The Sun / Pluto is in square aspect to Uranus and the Ascendant, an aspect that points to sudden massive upheavals and changes that affect the very core of his being. A Sun / Pluto birth conjunction can never have be repeated as a transit, so the big watersheds in the life would be marked by Pluto’s transit to the Moon and the square aspect to the Sun. Francisco de Sa Carneiro was elected Prime Minister of Portugal in December 1979, Pluto was conjunct the Moon / Jupiter in 1978 – 79. He was killed in the plane crash in December 1980 and Pluto was square to the Sun / Pluto from December 1980 to October 1982. 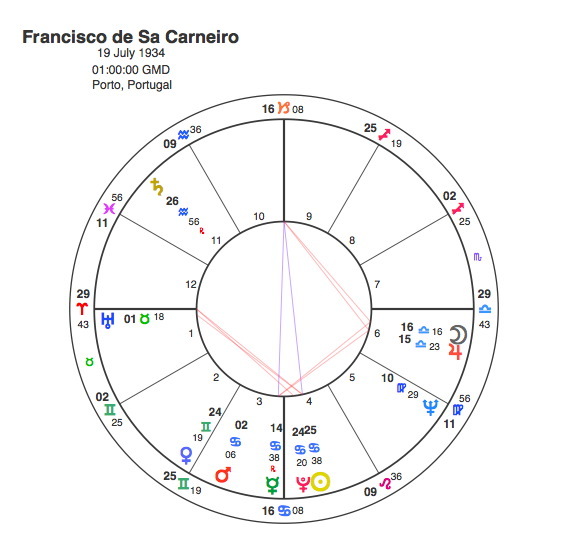 Pluto conjunct the Sun at birth usually produces a life of great intensity but the closeness of Sa Carneiro’s aspects took the ups and downs of one year to extremes almost beyond belief.